Measuring Method: Karl Fischer Volumetric Titration method. K.F. Dispensing: Highly sensitive motorized dispensing system. - Stirrer : Motorised Teflon coated magnetic stirrer. - Solenoid : No tedious solenoid valve setting. Display: 16 x 2 Alphanumeric LCD Display. Display Type: 8 digit bright red seven segment display. Power: 230V A.C 50 Hz. We offer Karl Fisher Titrator that is used to analyze the traces of water in a sample. 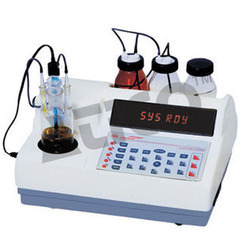 It comes with single burette system and 10 segment LED bargraph display to indicate level of titration and is suitable for the analysis of solid, liquid and gases. It is applicable in the areas like cement, pharmaceuticals, chemical, textiles and refineries. 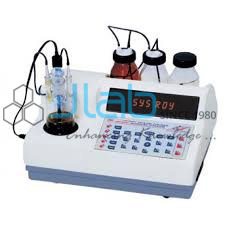 Glass agencies are manufacturer of auto karl fischer titrimeter. Sitro scientific is a leading preparer company of "karl fischer titrator". We can provide you best quality product at very competitive price. This eliminates the use of fragile glassware like burette. In turn parallax errors, auto zero errors are eliminated. K. F. Dispensing Resolution: 0.05ml.